Life is full of annoyances (the inevitable un-popped kernels in microwave popcorn, broken nails, stripped screws, etc.) 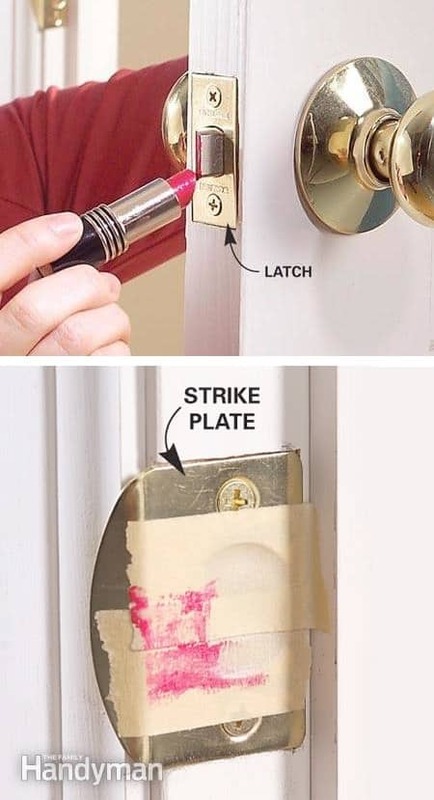 that can be easily solved with a few clever life hacks. These little tricks are like well-kept secrets– they don’t teach this stuff in school! There’s nothing that gets me more excited than finding ways to make everyday life easier, and therefor more enjoyable. 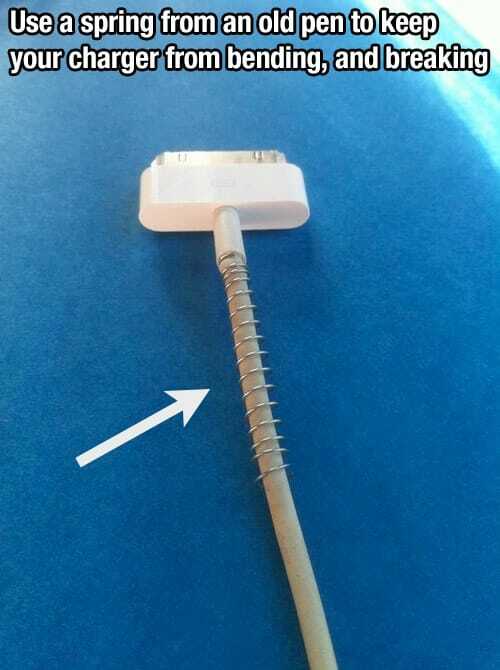 This is why I’ve eagerly compiled a round-up of life hacks that nobody should live without. 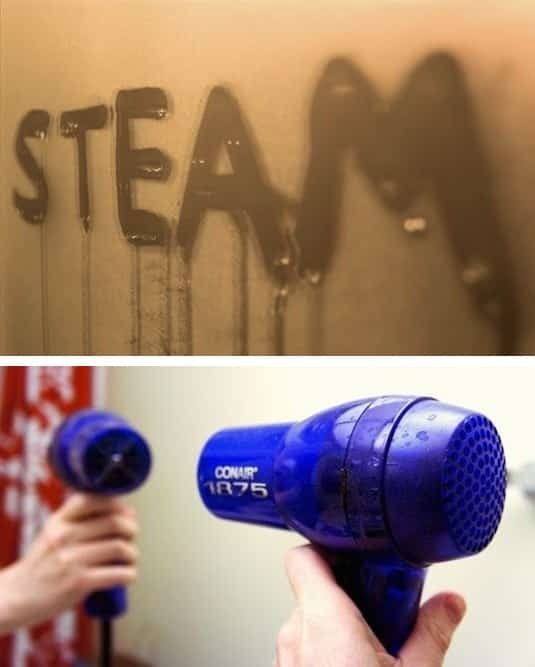 There are actually several things you can do to prevent your bathroom mirror from fogging up in the first place (shaving cream, vinegar, dish soap and car wax to name a few), but the easiest trick of them all is giving your mirror a quick, cool shot with your hair dryer. This is a helpful hack for small hotel bathrooms while traveling! 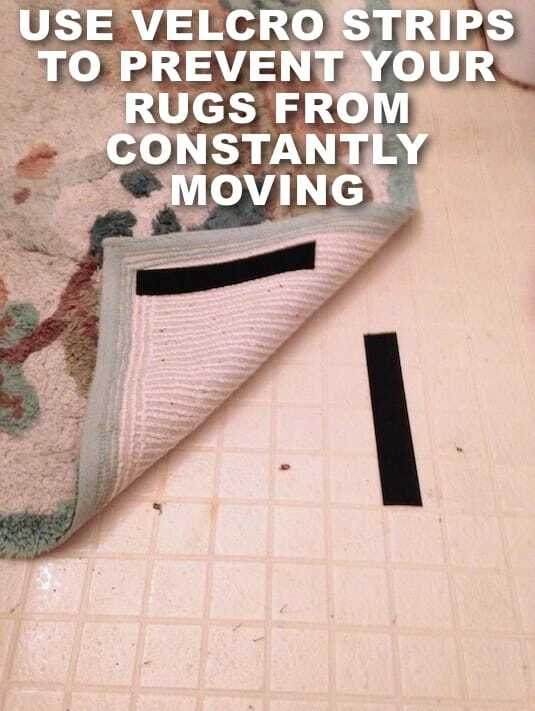 The nice thing about the small bathroom and kitchen rugs that come without the rubber back is that they are easier to wash, but unfortunately they just won’t stay put. To keep those little buggers in place, simply add a strip of velcro to the bottom of each corner to keep them from sliding all over the place! Smart. This would seem impossible, but the science behind it makes sense. 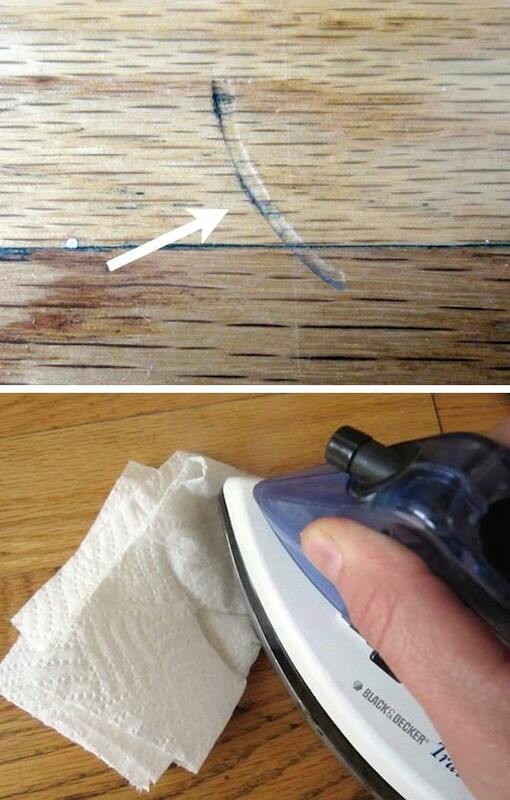 The steam from the iron and wet cloth or paper towel expands the wood where it has been dented in. Although you’d want to test it first in an area that isn’t as noticeable, it’s worth the 3-5 minutes it takes to try it out! I don’t think there is a single popcorn lover on this planet that has mastered the perfect bag of microwave popcorn (the unpopped kernels are pretty much a guarantee), but that doesn’t mean you can’t enjoy a bag without choking on them. 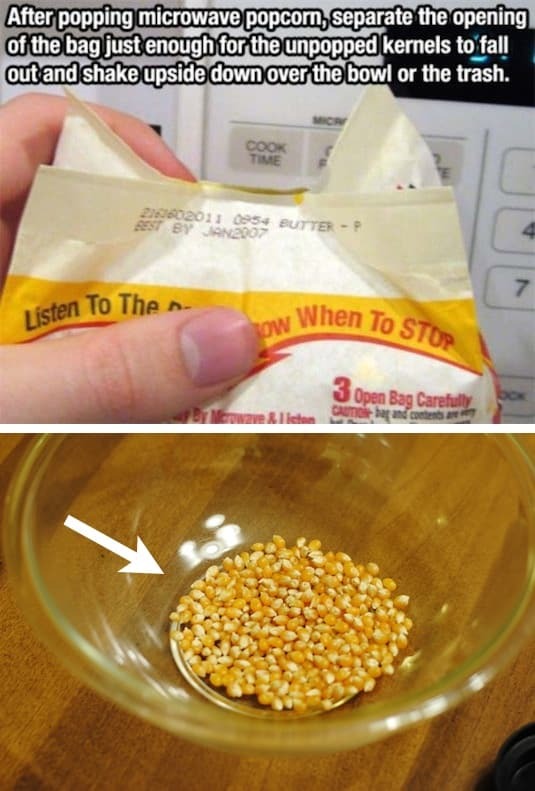 After popping, separate the opening of the bag just enough so that the kernels will fall through, and then shake the bag upside down over a bowl or trash can. You can now discard the kernels and actually enjoy your popcorn without the threat of a broken tooth. Adding or removing a key from a key ring is a fingernail disaster waiting to happen. 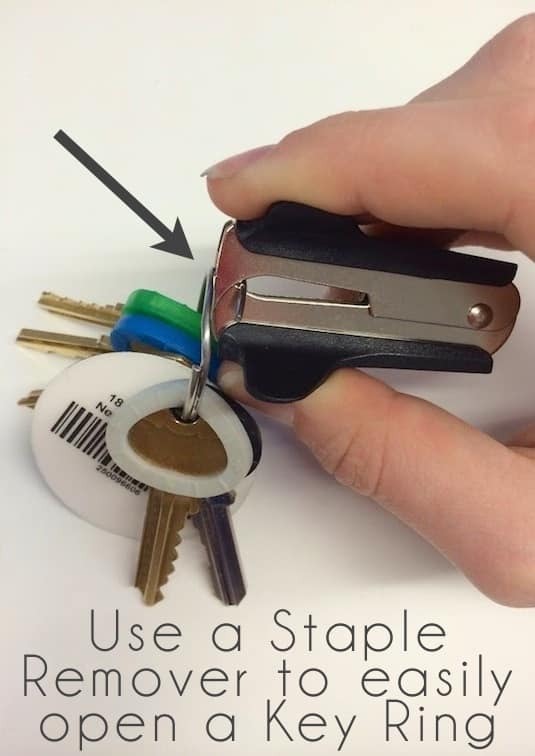 Instead of risking your manicure, try using a staple remover to easily open up the ring. Works like a charm! Pulling a bag out of a trash can is a challenge that sometimes takes four arms, a good squat and a little muscle thanks to the vacuum that prevents a trash bag from easily sliding out. To solve this problem, simply drill a few holes in the side of the can to release air pressure. It makes the whole trash-taking-out business a lot easier! P.S. 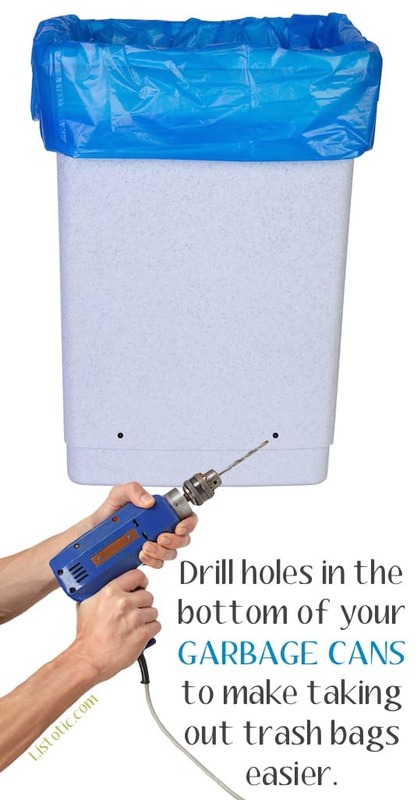 Avoid drilling the holes in the bottom as this could cause a leaky mess. With enough time and wear, your flip flop straps are bound to break through the hole in the bottom of the shoe, but this doesn’t mean they have to retire. 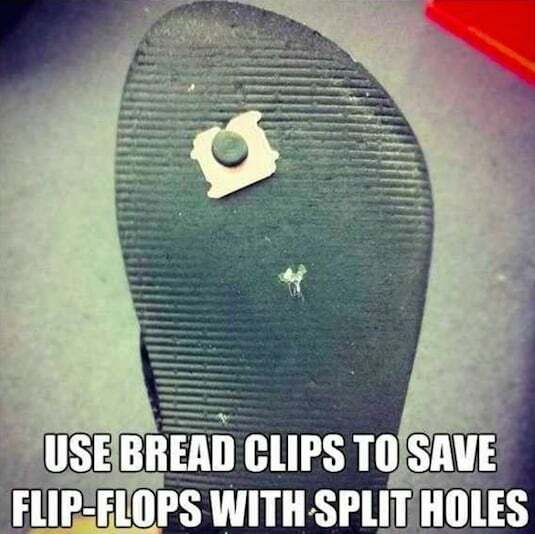 Use a bread clip to keep it from slipping through the split hole. Very clever and resourceful! A loose door hinge can be a tricky fix because the existing screw hole has stripped, causing the wiggly door problem. Fill in the hole with a golf tee and a little carpenter’s glue, and then cut of the end to create a flush piece of wood for your new screw. Don’t have a golf tee handy? I’ve also seen this done with toothpicks! 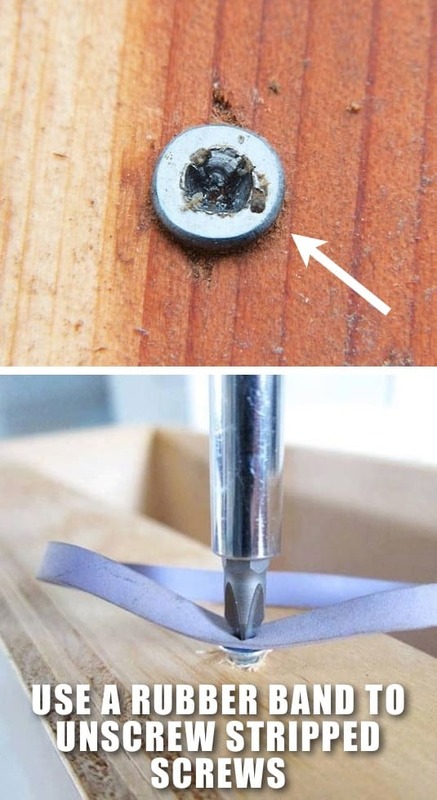 Use a rubber band in between a stripped screw and your screw driver to give it enough grip to remove. With all of the Rainbow Loom bands scattered on the floor in every room of my house (I have a 9 year old), this shouldn’t ever be a problem.